Samsung has officially released Android Pie for the Galaxy S9 and S9+ today, and the stable update comes with a few changes compared to the last Android Pie beta. One of these changes comes in the camera app when you’re using the front camera. The Selfie focus camera mode has now been renamed to Live Focus and it now works like Live Focus for the rear camera. That’s not to say that you get control over the level of background blur in selfies, but now, the camera will tell you if it’s ready to take a Live Focus (bokeh) selfie. Earlier, you had to fire blindly by pressing the shutter button, holding still, and hoping it would be able to blur out the background. 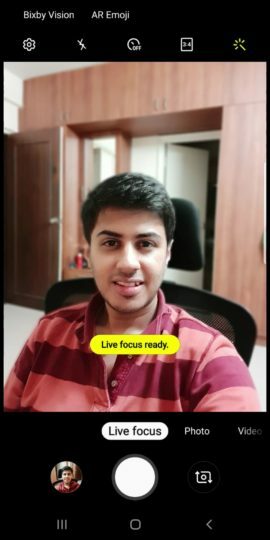 Now, once you frame your face in the camera, a yellow popup saying Live focus ready will show up. Once that happens, you can hit the shutter button to take the Live Focus selfie. Of course, the Galaxy S10 will take better advantage of this. The S10 is expected to have a dual camera setup at the front on at least two variants and it may also come with an upgraded version of Live Focus. The Galaxy A8 (2018) and Galaxy A8+ (2018) also have dual front cameras, though you might have to wait until April or later to see the Android Pie update on those devices. For more on what’s new Android Pie for your Galaxy S9, Galaxy Note 9, and other Galaxy devices, check out this ever expanding list. On my Note 8 One Ui Camera it’s not Live Focus, it’s Selective Focus. Are these two had the save function? Any news on updates to the ar emojis you were going to contact Samsung about? Please follow through on this as you said you would. Thank you.